There is more to know when choosing material for a driveway than the appearance. Driveway pavers are becoming the "norm" for many reasons rather than using concrete or asphalt to cover a driveway. Driveway pavers are offered in hundreds of colors and shapes, your imagination has endless choices in designing with driveway pavers. At ALL Masonry & Landscape Supply, we offer over 10,000 square feet of outside displays for our customers to choose from, we also offer free samples and give advice on all aspects of completing your project with driveway pavers. A Concrete Paver Driveway offers several different paver thicknesses in order to achieve more strength than regular concrete or asphalt slabs. The environment benefits as well since concrete pavers accepts a certain amount of rainfall which recharges our Earths system instead of running down the curbside and into the sewer. Brick Pavers, more specifically clay brick pavers, are produced from high fired clay creating a long lasting material having a very rich and deep color which will never fade. Brick Pavers are offered with beveled edges which provide crisp lines to any design pattern you choose without the need for mortar. Brick pavers made from clay are made under extreme pressure and offer compressive strength much greater than concrete pavers. 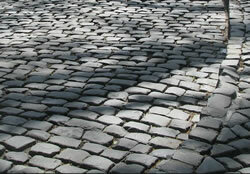 Some of the first streets on the East Coast were covered with Belgian cobblestone pavers. And other material, such as bluestone pavers, was used to create a stone paver driveway. These can still be chosen to create a rustic looking and long lasting driveway. Driveway pavers should be a minimum density of 8,000 pounds per inch and under one square foot in size per stone. Most driveway pavers are a minimum thickness of 60 mm, or, approximately 2 3/4 inches thick and should be installed over a compacted, sub-base of class 2 road base, a minimum thickness of four to six inches. One of the most advantageous aspects of using a driveway paver is the flexibility when or if the earth shifts, by using just concrete or asphalt for a driveway, cracking is almost inevitable and patching concrete or asphalt becomes an eyesore, as well as, more cracking to follow. 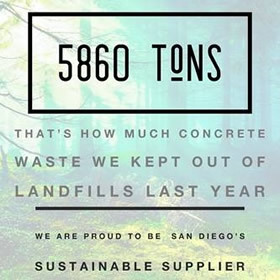 At ALL Masonry & Landscape Supply, we recycle broken concrete and asphalt at our company and offer better prices than any of our competitors. With the top selling manufactures products in stock, we offer almost a limitless choice for driveway pavers.